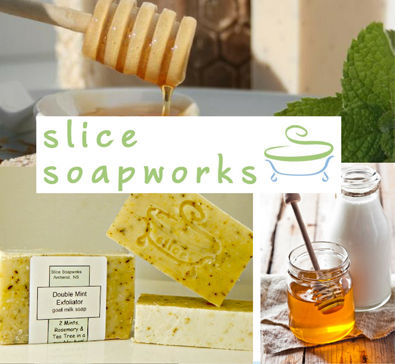 Slice Soapworks | Halifax Seaport Farmers' Market Ltd.
Slice Soapworks and Terri Yeomans are well known province wide for producing exceptional hand made soaps that are both gentle for the skin and the environment. The goat milk soaps have a dedicated and passionate following. Many of the herbs used in the natural soaps are grown in Terri’s own gardens while other local ingredients are sourced when ever possible. All Slice Soapwork’s products are vegetarian or vegan and cruelty free. Some of the other natural products produced by Slice are natural deodorant, whipped shea butter, bath bombs, salts and lotions. Slice’s studio space is in Amherst, NS. This is where production is done and where Terri teaches her popular soap making classes, sharing her passion and expertise for this old-world skill. Slice Soapwork’s regular fan base finds them Saturday and Sundays, year-round at the Halifax Seaport Farmer’s Market. Visitors to the market have carried these artisanal soaps worldwide and then continued to replenish ordering on-line.